If you've booked a RedAwning vacation rental in the past 12 months, you're ready to get $50 off your next RedAwning stay right now, as long as you book right here on our website RedAwning.com. 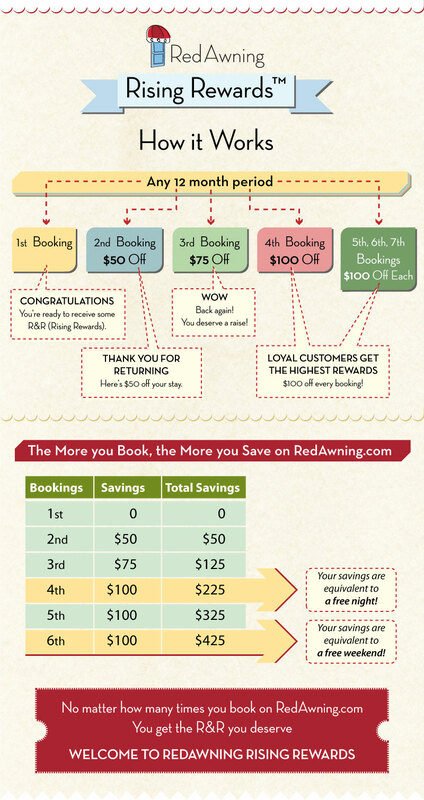 If you haven't yet booked with RedAwning.com, now's the time. Simply make your first booking and you've earned $50 off your next rental! Choose your destination and property on RedAwning.com and make your instant reservation. Add the word REWARDS in the Notes Section when booking. You will receive the discount separately. Come back to book a 3rd rental on RedAwning.com within 12 months and your discount will rise to $75. Book a 4th, 5th or 6th time and you'll save $100 off each stay. The average vacation rental traveler can save $400 or more each year -- there is no limit! Just make sure to note you are participating in the Rising Rewards program in the Notes Section when you make each booking. RedAwning Rising Rewards Program Terms and Conditions. Rising Rewards benefits are calculated based on your rental history in the 12 month period just prior to your booking (for example, if you are booking a stay on July 15, 2014, you’ll receive Rising Rewards credit for all bookings you’ve made since July 16, 2013). Once you reach 4 bookings in a 12 month period, you will continue to receive $100 off every future rental as long as you always have booked at least 3 stays in the rolling 12 month period prior to each successive booking you make. Your first RedAwning stay can be booked through any channel as long as it is a RedAwning stay. After that, only bookings made directly on the RedAwning.com website qualify to earn and use your Rising Rewards. Bookings cancelled for any reason do not qualify for Rising Rewards benefits. The Rising Rewards discount on each booking is limited to 10% of the rental cost, excluding taxes and cleaning fees. In order to indicate participation in the program, please put the word REWARDS in the Notes section when making your online booking. Your initial automatic reservation confirmation will not reflect the discount.The discount is applied and refunded separately from this billing. We will track your Rising Rewards based on your email address used for each booking. Please be sure to use the same email address for each booking for proper tracking. Rising Rewards Program Discounts cannot be combined with any other offers you may receive through RedAwning.com or third parties. The Rising Rewards Program is subject to change or cancellation at any time at RedAwning.com’s sole discretion. The Rising Rewards Program is currently not offered to Travel Agents who participate in our commission program.